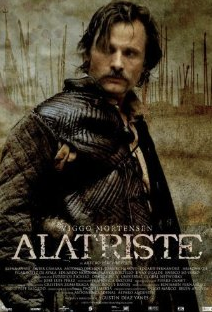 Today, I went along to the press conference and opening of the exbitition, ‘El Madrid de Alatriste, el Madrid del siglo de Oro‘ which coincides with the September release of the film "Alatriste", starring Viggo Mortensen of Lord of the Rings fame (he was the king if I need mentioning it!). The exhibition at the Casa de la Panaderia attempts to offer a tour of 17th Century Madrid using original costumes from the film, pictures of the shooting (created as oil paintings of the actors), poems, anecdotes, etc. The Madrid settings of Altriste, from its author Artur o Pérez-Reverte, follow the oldest and most well-known map of the city of Madrid – called the Plano de Texeira. I believe that many of the locations for the film are well-known places which visitors can still see today. Incididentally, the books of Alatriste have sold over 4.5 million copies in 12 languages and this is only the first instalment of the series.